Recorded, mixed and mastered at the Cove, Vashon Island, WA & Aleph Studios, Seattle, WA by Mell Dettmer August 2005. Vinyl cut by Rashad Becker at Dubplates & Mastering, Berlin May 2011. Speculum Magorum by Giordano Bruno. Eyvind Kang is a violist for whom the act of music and learning is a spiritual discipline. 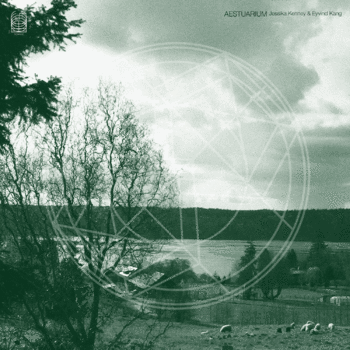 Aestuarium is a meditation on a psalm of lamentation and the unary tone in the metaphor of salt and fresh water, inspired by Gaelic psalmery, Tibetan notational gestures, and the microtonality of the tetrachord. Recorded on the shore of Colvos Passage in 2005 by renowned engineer Mell Dettmer. Stephen O'Malley comments: "Amongst many other amazing pieces Jessika & Eyvind collaborated on SUNN O)))'s "Monoliths & Dimensions" album, Jessika leading the choir on the piece "Big Church" and Eyvind composing the acoustic arrangements for "Big Church" & "Alice". I learned an immense amount about music through these collaborations, specifically the idea of Spectral music through research and discussion/reference points of composers such as Grisey and Murail. Aestuarium is a beautiful piece of minimalist spectral music which has brought great pleasure to my ears over the years." Originally released on CD by Endless Records 2005. Ideologic Organ curation and art direction by Stephen O'Malley, manufactured and distributed by Editions Mego.